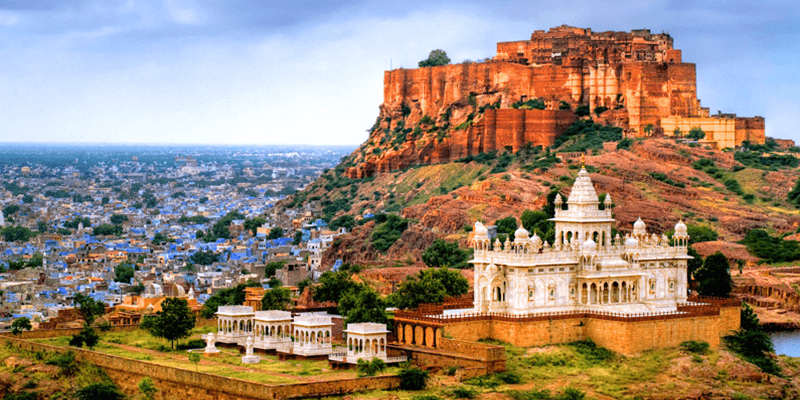 Jodhpur, Blue City of India, is a destination that you must have in your 2019 travel bucket-list. The first thing that captures your attention in Jodhpur is the color of the houses. There is a pretty interesting tale around these Blue houses, which earned the city its nickname as the Blue City of India. In the past, a special blue pigment was coated on the walls of Brahmin houses to demarcate them. But with the passage of time, this became a common practice and everyone wanted to dwell in a blue coated house! But that is not exactly a reason why Jodhpur tourism has flourished. Jodhpur city and its neighborhoods feature a rich heritage wearing palatial architectural wonders like forts, palaces, mausoleums and temples. Various gates of this walled city, like Fatehpol and Jayapol, glorify the past of this historic city in Rajasthan. Most of the Jodhpur tourist places showcase the stories of victory and valor from the past. Places to visit in Jodhpur leave a lasting impression on the minds of the tourists with their beauty and heritage. 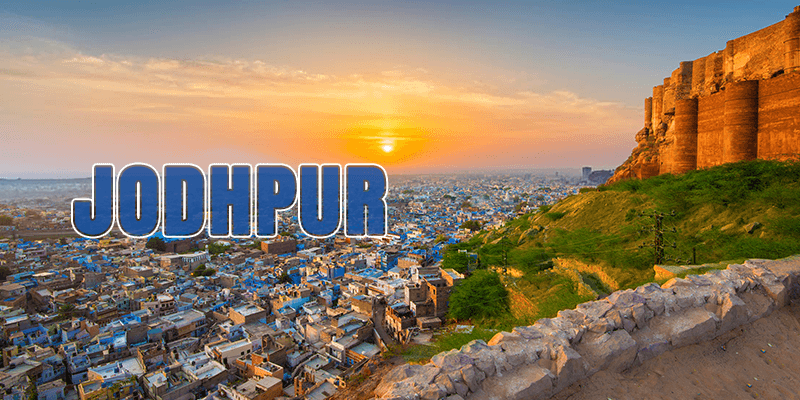 So, are you planning a trip to Jodhpur city? Let us explore this beautiful city. Rudyard Kipling called this fort “the work of a giant”. Mehrangarh Fort (or Jodhpur Fort) built, by Rao Jodha, in red stones decorates the city of Jodhpur. Standing 410 feet above the city, this imposing structure has been keeping a keen watch on the city since 1460. Mehrangarh Fort is decorated with seven intricately carved gates. Jayapol and Fatehpol are the two most popular among them. Two beautiful lakes are situated near the Fatehpol – Ranisar and Padmasar. These lakes were constructed in 1459. Ranisar was built for Queen Jasmade Hadi (Rao Jodha’s wife), while Padmasar was built for Queen Padmini (wife of Rao Ganga). Another landmark structure within the Mehrangarh Fort is the Chamunda Mata Temple. Rao Jodha was a devotee of Chamunda Mata and installed her idol at this temple in 1460. The temple has since become an important place of worship for all Jodhpuris. While shooting for a recent Bollywood film, ‘Thugs of Hindostan’, veteran actor Amitabh Bachchan described the beauty of Jodhpur Fort as “intricate designing … impregnable structure… its interiors so intricate”. Built in the early part of 20th century, Umaid Bhawan Palace is one of the world’s largest private residences. The palace has 347 rooms and housed the Royal family of Jodhpur. This lavish palace, designed by renowned British architect HV Lanchester, is decorated with sandstone and marble. The architecture of this palace primarily follows the Indo-Saracenic style with a touch of Western Classical Revival and Indian styles. 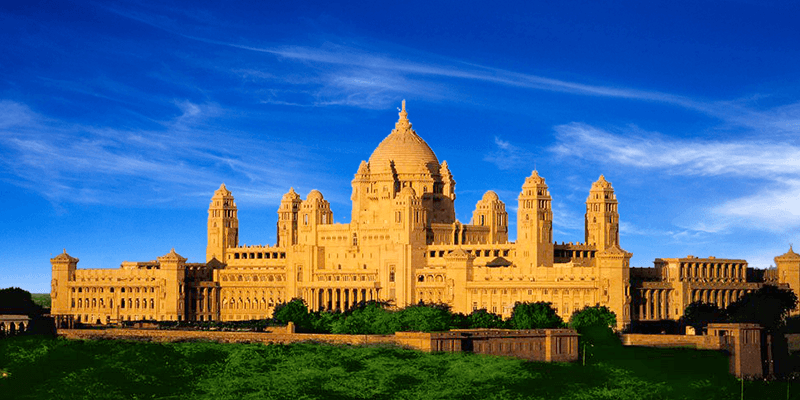 During the construction of the Umaid Bhawan Palace most of the stones were brought from Chittar Hill, and thus the palace went by the name of Chittar Palace. While at this palace, do visit the Museum. It contains a stuffed leopard which the Maharaja shot as well as a symbolic flag given to Maharaja Jaswant Singh by Queen Victoria. Jaswant Thada is a cenotaph or funerary monument built by Maharaja Sardar Singh of Jodhpur in 1899 in memory of his father Maharaja Jaswant Singh II. 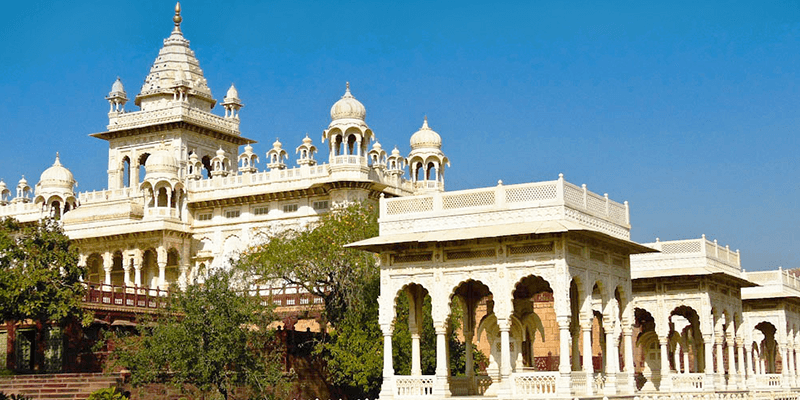 Even today, Jaswant Thada serves as the cremation ground for the members of the Royal family. Made with marble and decorated with intricate carvings, it would not be an exaggeration to call this monument the “Taj Mahal of Mewar”. The marbles emanate a soft glow during the sunshine hours, which delights the onlookers. This peaceful monument has tiered gardens and a lake. The Cenotaph of Maharaja Jaswant Singh contains portraits of all the Maharajas of Jodhpur. The towering Clock Tower (Ghanta Ghar) is a magnificent landmark in the old city. Unlike other old clock towers found across India, this is not Gothic in its style. Ghanta Ghar was built by Maharaja Sardar Singh in late 1890s and features the Indian aspects. 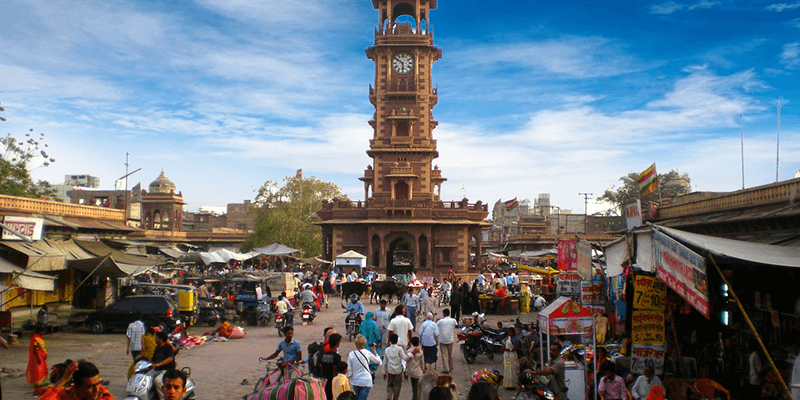 A bustling market has come up in the vicinity of this clock tower and it is popular as the Sardar Bazar. Sardar Bazar is a dream destination for any shopaholic. It is lined with shops selling colourful scarfs, silk Pashminas, Pink and Orange hue skirts and great Red turbans. You can also buy oxidized silver and gold jewels, hand sewn carpets, handcrafted scarves, puppets, dyes textiles and leather shoes or bags from the Sardar Bazar. 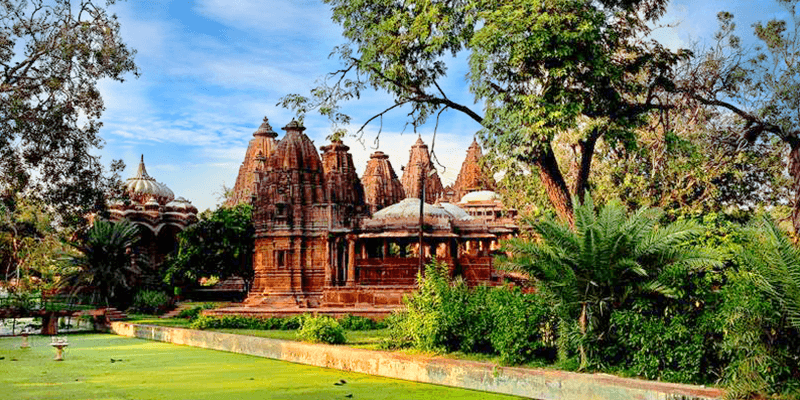 About 9 KM away from Jodhpur city, Mandore is a historic town. It was once the Marwar kingdom, but in the following years the importance of the city declined when the capital was shifted to Mehrangarh. However, Mandore is still known for its beautiful Mandore Garden. This vast tract of land contains the ancient ruins from the Rathore clan. Spread across the terraced Mandore Garden you will find many umbrella like structures which are the cenotaphs of kings. The best cenotaph is that of Maharaja Ajit Singh that is situated on a hill and decorated with red sandstone. Within the Garden is a special section known as the Hall of Heroes. It is dedicated to deities and renowned Rajpur fighters. If you want to experience the natural beauty of Jodhpur, then Kaylana Lake would one of the Jodhpur tourist places you must visit. Boat rides on this lake are a popular tourist attraction. The shores of the lake are surrounded by Babool trees that carry an exotic appeal when in full bloom. During your boat ride you would be left wonder-struck by the canvas of colors etched before you. 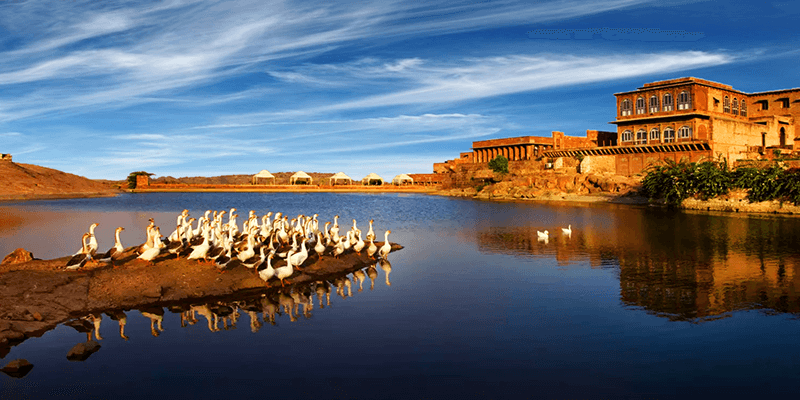 Kaylana Lake is the foremost among places to visit in Jodhpur for the bird lovers. You can easily spot Siberian Cranes sitting on the shores of this lake. After the boat ride, do take a stroll along the Pratap Sagar Garden sitting on the shores of Kaylana Lake. So, when are you visiting Jodhpur? Do care to use the travel services of RailYatri to make your trip memorable. Next article6 Hidden gems of Palamu you must shortly visit! Thanks for the article mate. The entry rs will help me out a lot.